Ever since I started using my iPhone, my 5th generation 60GB iPod has been relegated to dust catching duty. That is really a shame. The iPod works great, holds a ton more music than my 8GB iPhone, and looks brand new. But because my iPhone is also my cell phone, it is always with me. And because it, too, is an iPod, I don’t find the need to bring the 60GB iPod with me very often. In fact, it has been down graded to the “take on a long trip” mode. Besides, it holds all my music, not just the playlists I choose to sync with my iPhone. (Usually only top rated, new albums, and podcasts.) Unfortunately, as my music collection has grown, it has now surpassed the 60GB limit of my iPod. A few weeks ago, a company called Apricorn emailed me about a self-upgrade kit for the iPod. For $269, the kit includes a 240GB Hard Drive, a new 850mAH battery, and the plastic tools needed to crack open and update the iPod. On first inspection, the iPod upgrade kit may not sound like a great deal to you. But when you consider that a brand-new iPod classic comes with a max HD of 120GB, you are actually getting twice the storage space, and a longer lasting battery for only $20 more. And if you are like me, you have tried very hard to keep your iPod in good condition. When the package from Apricorn arrived, I unboxed everything, and laid the iPod out as if it were going into surgery… which it was. Included in the box from Apricorn besides the tools, battery, and hard drive is a CD-ROM, on which is a video tutorial on how to perform the upgrade. And it is here that the value of the kit is truly realized. Yes, there are a lot of video tutorials online for taking apart your iPod. Many of those are of dubious quality, especially those on YouTube. Here, on the included disc, is a video of much higher quality, with an easy to navigate menu to let you jump right to the part you need. There is also a troubleshooting area, in case things don’t go according to plan. Let’s break down each item. The included Hard Drive is, well, a Hard Drive. It comes with new padding (shock absorbers) that seem a little thicker than that which came with the original hard drive. Because of the increase in space, I can easily fit my entire music library on my iPod, three times over. The included 850mAH battery has 30% more capacity than the battery that originally came with the iPod. And after years of use, as my iPod has on it, that capacity begins to decrease. Eventually, the iPod battery will no longer hold a charge, at which time most people simply go out and buy a new iPod. 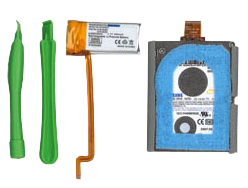 But the battery in this kit brings new, longer life to your current iPod. It will play for longer on a charge than it did when the iPod was new. And the new battery will push the lifespan of your iPod out for years to come. As I wrote above, this is a clear winner. It takes you, step by step, through the entire process. Both the vocals and the voice-over are well done, and the intuitive menu makes jumping back to a particular session easy as can be. Ah, the green plastic tools. This is the one area where I was disappointed in the Apricorn iPod Upgrade Kit. The tools are cheap, and the sharp edges, meant to help you crack open your iPod, both bent and broke on me while trying (carefully!) to open my iPod. I had to make a trip to my toolbox and use a pair of metal screwdrivers. Very, very small screwdrivers to be sure. But metal, and that worked like a charm. While I did not run into many problems upgrading my iPod, I don’t recommend everybody try this unless you are both very comfortable around very tiny electronics, and you have confidence in yourself to do it. If you don’t, please let a professional update and upgrade your iPod for you. It will cost more, yes, but the security of letting someone else with much more experience than you is worth the price. I am, overall, very pleased with the Apricorn iPod Upgrade Kit. I would recommend to them that they include better tools, but everything else is first-rate!